Unless you live in a cave without wifi, you’ve probably heard of crowdsourcing–when a whole mass of people, usually an online community, creates content, or news, or cheerfully debugs an operating system. We like the idea, but we tend to steer clear of crowds. They’re just too damn loud. They have a tendency to jostle. Sometimes they stampede, or else you get pick-pocketed. So, how about something a little smaller-scale? Perhaps the readers of this very blog can combine their efforts and solve a problem. Dozen-sourcing! This post was going to be about “Eraser Shims.” You know those cap erasers–the ones you buy in packs of 12 and put on your pencils like little mushroom-shaped hats? Wouldn’t you know it? The act of erasing wriggles the pencil around inside these erasers, slowly stretching the rubber, loosening the eraser’s grip on your pencil. You have to fix that, or else it falls off. Or else you lose your eraser. So you get the brilliant idea of making a shim. Robert Pirsig talks about shims in Zen and the Art of Motorcycle Maintenance. You never did get through that one, but he created an association in your mind between shims and some sort of minor genius. You can make a shim for your eraser by ripping a small strip of paper and wrapping it around the non-business end of the pencil, making the pencil slightly wider, so the eraser will grip more tightly. You can do this, but don’t. It stretches the eraser even more. 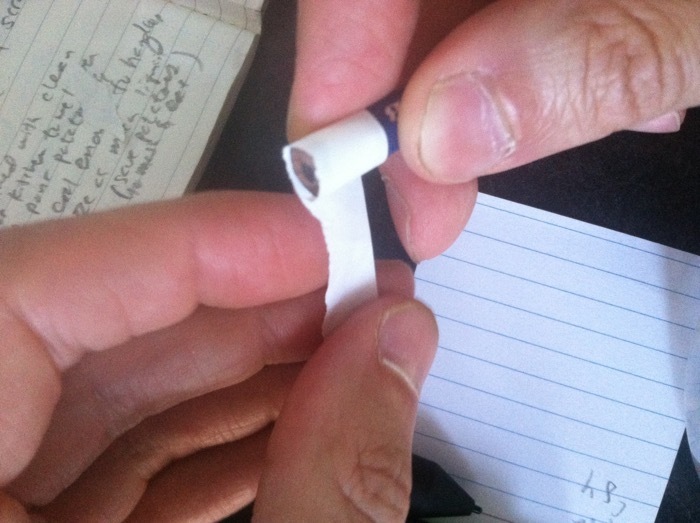 And if you stubbornly make an even thicker shim out of a strip of index card, you’ll tear the eraser. So you change the paradigm. You get a rubber band and wrap it around the eraser, “around stem of the mushroom,” as they say, but it looks awful. And the rubber band catches on your hair when you put the pencil behind your ear. You mutter to yourself, Hmmm…how about those tiny orthodontic rubber bands? There’s something wrong with this idea, though. You shouldn’t have to go to a medical supply store to fix a pencil. You should be able to do it with regular household supplies. You start daydreaming about a twist-tie, but you suspect the little wire will concentrate the hugging force too much, and you’ll end up tearing the eraser. Of course you could glue the eraser on, but let’s be serious. Meanwhile the eraser keeps falling off. You take pictures of it sitting on the floor of the office, on the stairs after you sit there reading Pnin, in the grass, et cetera. You keep almost losing it. You’re getting more and more stories. But then it’s too late. 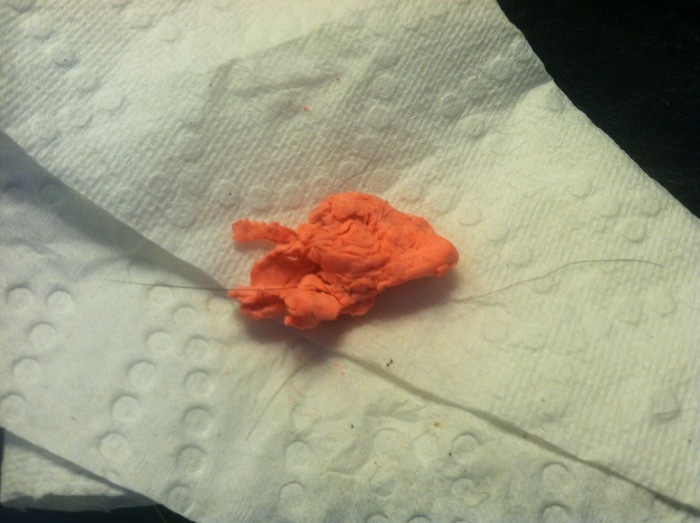 How did the dog get a piece of chewing gum? Oh, that was your eraser. 3M Command Strips cut in diameter of “non-business” end. That’ll hold the suckers on & save the animals! I like the idea of a “Command Strip” hiding inside the “non-business” end of my pencil, but I don’t want to have to buy something that specific. I think you are onto something with the double-sided-stickiness approach. Next time I will try making my own piece of double-sided tape. I just don’t make any mistakes.